A couple of years back pomegranate was having a bit of a moment in the restaurant scene in Tallinn and rightfully so. It's an exciting fruit that I fell in love with in Israel and West Bank - the street vendors in narrow alleyways of the maze-like medinas (old towns) sell a freshly squeezed pomegranate juice that in all its zingy freshness really gives a boost. Apparently the forbidden fruit that Eve tempted the Adam to eat was this and not apple was we've been taught. 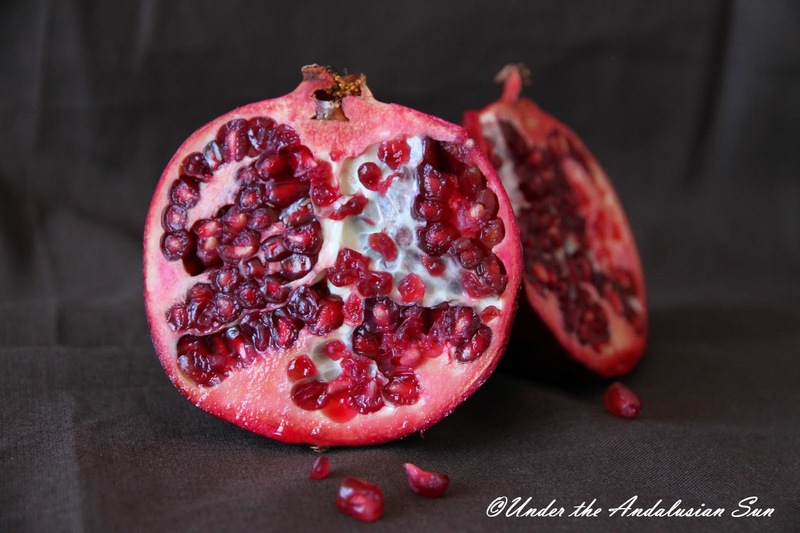 And here's another piece of trivia I learnt from a rabbi: each pomegranate has exactly 613 seeds. Those seeds are the only thing that is consumed from this fruit. They provide a lovely burst of flavour and crunch into couscous and salads such as tabbouleh. 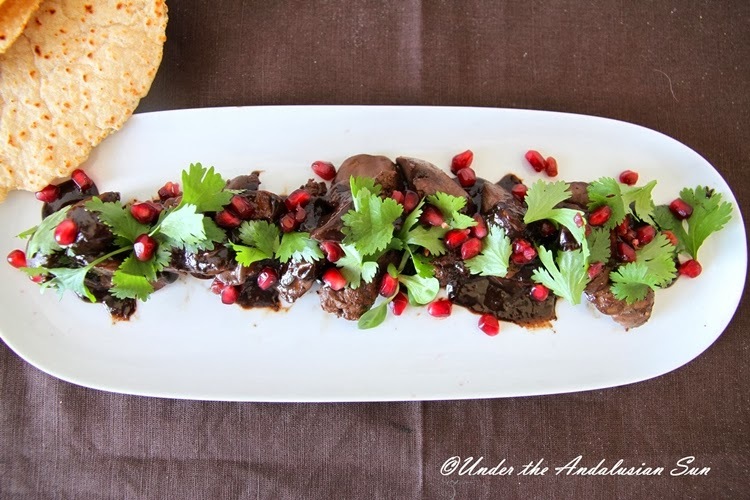 This dish uses both pomegranate seeds and pomegranate molasses. That can be bought in ethnic supermarkets such as Hauler Market in Hakaniemi. They, too, have differences, so depending on the acidity of yours, you might want to add a bit of sugar to balance it out. As a light lunch with some leaves this recipe is enough for 2. As a starter or part of a meze this feeds 4. Brown the livers in butter. Add wine, stock, pomegranate molasses and cardamom. Cook the livers to your desires doneness and lift them out of the pan. Keep them covered. Reduce the sauce to syrup-like consistency, season and before serving add a small knob of butter that not only gives it a nice sheen, but also rounds the flavours and balances the kick of the pomegranate. 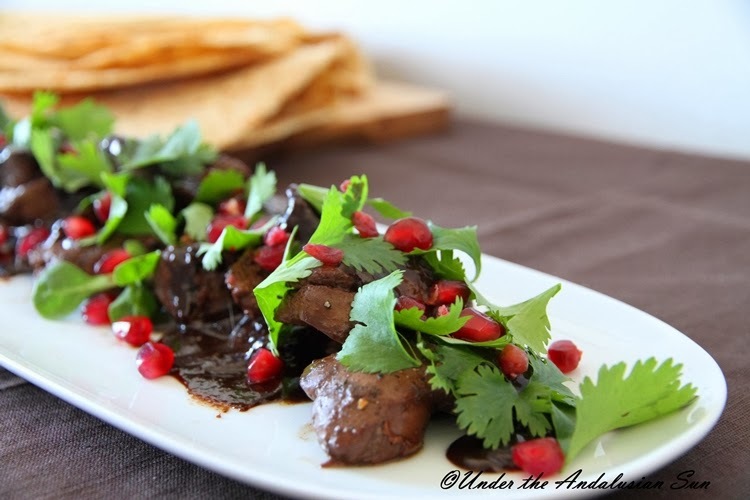 Sprinkle coriander leaves and pomegranate seeds on top and serve. For instance with Arabian flat bread. Mix the dry ingredients. Mix oil/ butter into the yogurt, combine the ingredients and work into a smooth dough. Cut it in half and each half into 4. Roll on a lightly floured surface as thinly as you can and bake in a hot, dry pan. After baking keep covered until ready to serve. If you're serving the bread without a strong-flavoured dish such as these chicken livers, you might want to add some herb/ spices into the mix.